The HERO System - the game rules on which Champions runs - is one of the early engines of the RPG hobby, known for its incredible nuance and complexity. "First and foremost, while it's often mocked in some circles as being too complicated or math-intensive, the HERO System offers matchless flexibility for designing characters, spells, settings, vehicles - anything you'd want in a game - and for actually running an RPG. Even in today's era of 'rules-light' games, that's a powerful attraction for a major subset of RPG players. For some of them, the creation process is as much fun as playing. If you 'grok' the HERO System, it will free up your creativity in ways no other RPG can even approach," Long explains. It's that flexibility and control over the details that gave Champions a reputation for crazy creativity in superhero design 20 years before City of Heroes came along. "I can definitely see its influences in other RPGs, which have adopted and adapted the concepts of buying things with points, disadvantages and other elements that largely came to the gaming public's attention via Champions (even if they weren't necessarily 'invented' by Champions)." "Second," says Long, "many competing superhero RPGs have been based on a license from DC, Marvel, or whomever. That's cool in its own way, but I think ultimately most gamers, and certainly most HERO System gamers, want to create their own settings, characters, histories and events. 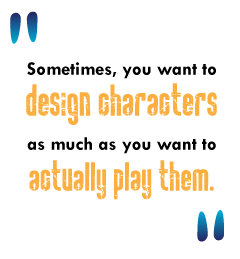 They don't want a pre-packaged world or characters, they want to create their own." It's a sentiment familiar to all those MMORPG players with hosts of hardly-played characters populating their rosters. Sometimes, you want to design characters as much as you want to actually play them. As for videogame titles, Long says, "I think the influence of Champions can be seen in games like Freedom Force and City Of Heroes, though, of course, neither derives directly from it. Many of today's computer RPG designers have played Champions, and I think you can see traces of that in their work. After the Cryptic deal was announced, I got a bunch of e-mails from Cryptic employees saying basically, 'I've loved Champions for years and am really looking forward to working with you guys,' which was very gratifying." The game certainly had the attention of MMO producers. "Jack Emmert called us up one day in December and said, 'Hey, would you guys be willing to sell me Champions for an MMO?' That was it - it came right out of the blue, and they approached us rather than the reverse. The whole deal was basically done inside of a month."